1870 SG48 1/2d ROSE RED UNUSED SET PLATE COLLECTION ON ALBUM PAGE (NO PLATE 9). No plate 9, otherwise a full set of all issued plates from 1 to 20 unused. All are hinged with gum, except for plates 3, 5, & 13 which have no gum. The odd bit of toning and usual gum crackling as usual with this issue. We do our very best to describe any faults that cannot be seen in the image of the item/items as accurately as possible. SG Catalogue value is for reference purposes only. Member of the Philatelic Traders Society and the Great Britain Philatelic Society. 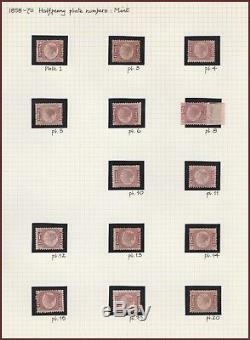 The item "1870 SG48 1/2d ROSE RED UNUSED SET PLATE COLLECTION ON ALBUM PAGE (NO PLATE 9)" is in sale since Thursday, November 2, 2017. This item is in the category "Stamps\Great Britain\Victoria\Line-Engraved Issues". The seller is "elstreestamps" and is located in Borehamwood. This item can be shipped worldwide.